How effective have state and federal governments been in cleaning up U. S. rivers and streams? ICPRB used historical data to analyze trends in water quality that occurred after there was a strong push for environmental legislation several decades ago. Congress, responding to public alarm about acid rain, toxic waste, and sewage-laden effluents, enacted laws in the 1970s to regulate pollutants in public waters. States, in conjunction with the U.S. Environmental Protection Agency, were charged with implementing policies to clean up and protect the nation’s waters. 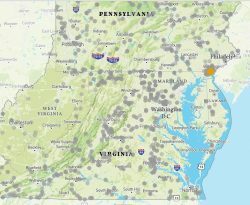 Inspired by a 2015 ICPRB project in West Virginia, researchers looked at outcomes of the cleanup efforts across the Mid-Atlantic. Water Quality Data Explorer – This interactive, flexible, computer application allows users to check station geographic coordinates and locate nearby flow gages, visually assess sampling frequency, identify outliers, determine if minimum detection limits (MDLs) are influencing apparent trends, view seasonal patterns and flow-normalized time series, and review metadata and related literature. Analyses were based largely on data from two sources, the U. S. EPA STOrage and RETrieval (STORET) Legacy Data Center and the joint agency Water Quality Portal (WQP). Trends were determined in water chemistry data collected at long-term monitoring stations. Water Quality Data Explorer, an interactive computer application, was developed to speed up quality assurance of the raw data, review seasonal patterns, visualize actual and flow-normalized trends in the data, and flag or correct problematic data. Trends in pH in the Mid-Atlantic since 1972. Some successful policies can be linked to a preponderance of trends in the same direction across the region. The phosphate-detergent ban and implementation of tertiary treatment at many wastewater treatment plants in the region significantly reduced phosphorus concentrations in streams and rivers. Likewise, remediation of acid mine drainage and coal-fired power plant emissions significantly improved acid (H+) concentrations, thereby raising pH values in many streams and rivers. Trends in total phosphorous in the Mid-Atlantic since 1972. Other long-term trends clearly indicate emerging problems in the region. Broad-scale increases are occurring in total dissolved solids, chloride, and specific conductivity.